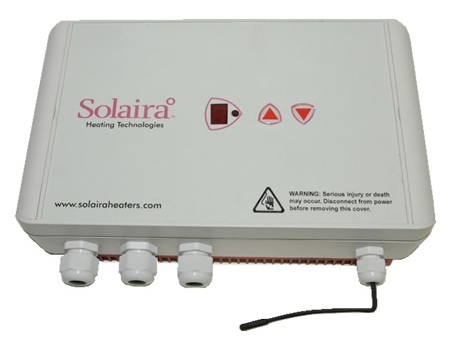 The Solaira SMaRT 16 Digital Dual Voltage Variable Control - 120/240 VAC, 1.92/3.84 kW, 16 amps is part of a family of water-resistant Solaira SMaRT controllers designed to provide energy savings when used with infrared heaters or other heating and lighting products. The Solaira SMaRT 16 Dual Voltage Variable Controller has a 1 to 10 step setting allowing you to find the optimum comfort setting in your specific area. With energy saving a major factor in the design, the feature rich Solaira SMaRT 16 Dual Voltage can automatically manage the heating system.